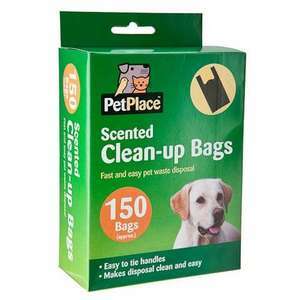 Being a responsible pet owner is easier than ever with Petplace Clean-up Bags. This 150 bag pack comes with an easy grip scooper and the bags themselves have easy tie handles. Another great value product from Dealz - just £1! Love dog poo bags, as if they are strong enough, the poo can warm up your hand and pocket when out for a chilly walk. Almost makes me wish I had a dog. I would just go2 the supermarket fruit n veg section & grab a load of those bags off the reel when buying fruit etc heated btw not that i've got a mutt anymore! Can you not just get 300 scented nappy sacks from Tesco for 35p?! You get 200 in B&M for 89p and £1 in ASDA. I have no use for a scooper as my Chihuahuas poops are tiny. Heat given.You get 200 in B&M for 89p and £1 in ASDA.I have no use for a … Heat given.You get 200 in B&M for 89p and £1 in ASDA.I have no use for a scooper as my Chihuahuas poops are tiny. This won't help everyone, but if you live in Dumfries and Galloway, Scotland, you can pick up dog poo bags free of charge from the local authority offices and the customer service centres. Can my ipad 3 fit in these bags or is it too big a crap to put in ? If you get these you better get some alcohol gel to clean your hands with as they're so thin you either put your fingers through or need to triple bag. Home and Bargain do 100 extra strong for about 89p. Yes it is - but you can fit an iPhone in them easily. Neats nappy bags come in a box of 300 and are £1.39 in Morrisons. I think they are the best balance between quality and cost. Have always thought "dedicated" dog bags are overpriced. It's just a bag after all. It's not a joke it's a fact. I want to know what deranged dog owners put the dog crap in the bag and then either leave it on the path or dump in the hedge. This won't help everyone, but if you live in Dumfries and Galloway, … This won't help everyone, but if you live in Dumfries and Galloway, Scotland, you can pick up dog poo bags free of charge from the local authority offices and the customer service centres. I would just go2 the supermarket fruit n veg section & grab a load of … I would just go2 the supermarket fruit n veg section & grab a load of those bags off the reel when buying fruit etc heated btw not that i've got a mutt anymore! nice way to get **** on your hands. Well that's my Xmas shopping done for the neighbours. I use these for cleaning out the cat litter tray. I just send the dog round to the neighbours and let him s**t through the letterbox. Better still= pickup the dog poo in these bags and post it through the dog owners letter box=nice. That 100 pack of Doggy Bags in Home Bargains is the best. Nappy sacks and other cheapo dog poo bags are too thin. Try picking up some soft dog **** with one of those bags and you'll end up with.... yuk! It is what I hate about owning dogs, pain in the **** they are. If that's the way you feel you shouldn't own one then - perhaps a goldfish they're pretty low maintenance. Completely agree with earlier comment, we buy 300 nappy sacks for 35p in Tesco. Why pay so much more? Well I suppose if you have a diamond encrusted poo bag holder..........!